Bath Sizes: What Is the Ideal Fit for Your Bathroom? Did you know that the average woman spends roughly 3.25 years of her life in her bathroom? That’s a lot of time! So, given the copious hours we spend in the bathroom, you’ll want everything just how you want it if you’re spending your hard earned money on a renovation. This is where bath sizes come into their own. Now, you’ve probably never considered the subject in much detail, but it’s essential you do before you make any final decisions. The bath is a focal point in any bathroom, so getting the right size is crucial if you want to complement the space. Let’s dive into the specifics! What’s The Average Bath Size? 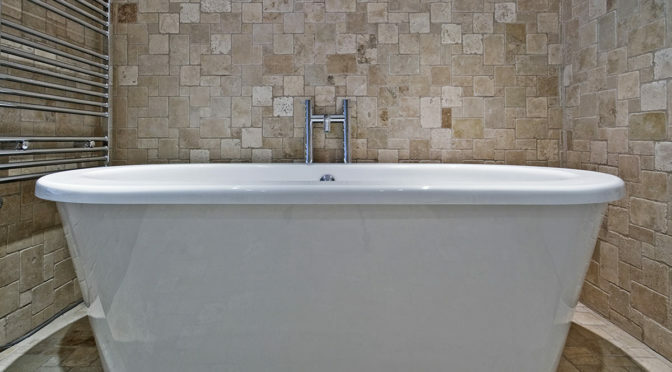 In the UK, the average sized bath is 1700mm long and 700mm wide. However, a typical small bath usually measures approximately between 1400mm-1500mm in length, and 700mm wide. On the flip side, a larger bath stands at roughly 1800mm long and roughly 800mm broad. Typically, these bigger baths are freestanding. They’re the perfect option if you have a more spacious bathroom. You should note that generally, bathtubs don’t exceed 2000mm in length. Top tip: it doesn’t matter what size bath you opt for, we suggest leaving at least 760mm around it. This is usually a comfortable amount of space for everything else to fit in. What is the Perfect Bath Size for Your Space? You can work out the ideal sized bath for your space using a bit of common sense. The average size of a UK bathroom is roughly 2400 x 1500 mm. If this sounds like yours, you’re probably short on space. The most obvious solution is to go for a shorter shower-bath measuring at around 1500mm long. Or, you could opt for a corner-shaped bath, this is a massive space saver (again, you can source a model that measures around 1500mm in length). However, if you’re lucky enough to have a larger bathroom measuring approximately 3660mm x 3050mm, then you have way more options available to you! However, this is often both a blessing and a curse for homeowners because with more space comes more choice; this be a little daunting! The last thing you want is a regular sized bath. Usually, these end up looking relatively insignificant in amongst the copious space. If that’s an issue for you, there’s a quick fix. Change the position of your bath. It’s as simple as that. This is where freestanding baths steal the show. They’re bang on trend, so we can’t get enough of them! Top Tip: before committing to buying anything, lay out all of the dimensions on paper. This will allow you to get a feel for how you’ll use the space. It’s common for people to measure wall to wall when they’re sizing up for a new bath. However, this isn’t usually representative of the actual space they have, especially, if the walls are tiled on both ends (this section is only relevant for non-freestanding baths). For those of you who don’t know, baths usually sit underneath the tiles; this means the exact amount of space you have to fit your new bath lies between untiled walls. We’re not saying you should rip away all the tiling. Instead, you can add an extra 10-30mm onto your original measurement. This is a more accurate amount of space you have to play around with. You’ll be surprised how many doors this little extra wriggle room opens for you! A single ended bath: this is where the overflow position is at the end of the bath, not the centre. Typically, one side is sloped making it ideal for showering. A double-ended bath: these are perfect if you and your partner enjoy a long relaxing soak together. Or, perhaps you’re someone who enjoys plenty of space to bathe in; either way, they’re divine! Plus, double-ended baths are fantastic if you prefer a symmetrical look because the waste and overflow are in the middle of the bath. The shower bath: this is a popular option. As previously discussed, UK bathrooms tend to be pretty small. So, a shower bath provides the perfect space-saving solution! Top Tip: Opt for a shower bath that has an integrated shelf, these are so handy. You don’t want to continually crouch down to the floor to pick up your toiletries! A roll top bath: or slipper bath are types of freestanding bath. Typically, the edges at the top curve which is what gives these models a distinctively classic look. Some designs also incorporate clawfoot feet. They’re sleek, and ooze class, which is one of the reasons they’ve become increasingly popular with interior designers. Was This Article About Bath Sizes Interesting? If you found this feature about bath sizes useful, then we’re confident you’ll enjoy the other pieces published on our blog. Over there we discuss everything from things you should know about changing your bathroom taps, to tips on how to make your bathroom more accessible. Enjoy! Alternatively, if you have any questions on the subject of bathrooms, please feel free to reach out and contact us via our contact form. We always try to get back to these queries as soon as possible. Speak soon! Previous PostThe Ultimate Guide to Selecting Low-Pressure Bathroom TapsNext PostWalk-In Shower vs Bath: Which Is Better for Your Home?